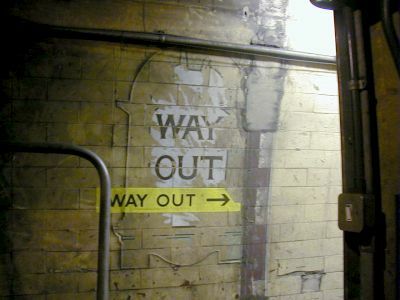 Whilst being used during the Second World War as the headquarters for the Railway Executive and in the early days of the War by Churchill's Cabinet, many signs were painted on the walls around the station. This page shows some of these signs. The first signs that are encountered as you walk down the spiral staircase can be seen painted on the door to the "bathroom" area. 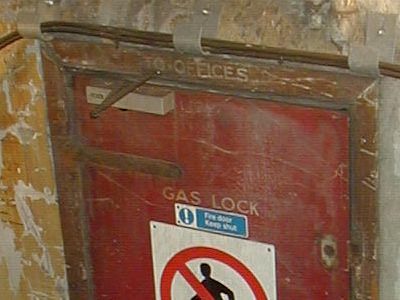 The GAS LOCK refers to the fact that the door needed to be kept closed at all times to keep the positive pressure that was maintained by air pumps within the complex. 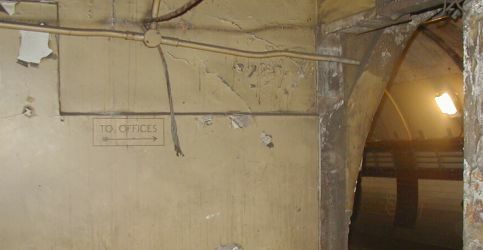 The OFFICES sign implies that this is also an alternative route down to the platform offices. 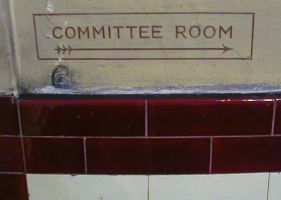 This was done as the area used as the Committee Room would seal off access to the platform if a meeting was taking place. 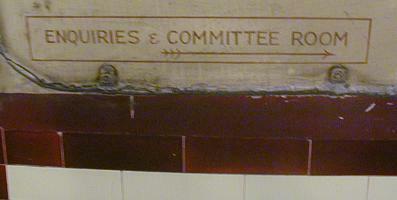 Once through the door and past the toilets and bathrooms, another sign reinforces the route to the offices below. Following the previous sign would eventually lead to a staircase and short passage which then joins with the main corridor down to the offices. Here, another sign points the way immediately before reaching the main tunnel. The Committee Room would be immediately to the right of this doorway. Going down the main spiral staircase rather than going through the bathroom area would reveal two more signs along the main corridor, leading up to the Executive Committee room. Signs in Down Street not only showed the way down, some also point the way back to the street. 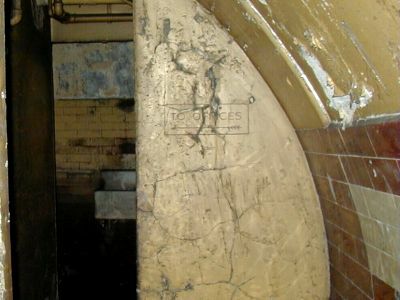 This final image of the World War 2 signs shows the partially covered sign at the foot of the staircase at platform level which shows that the staircase leads both to the exit and also to the Committee Room. 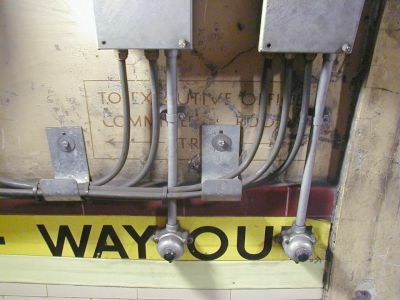 At around the same time, the station's original decoration was painted over, including most of the original signs. 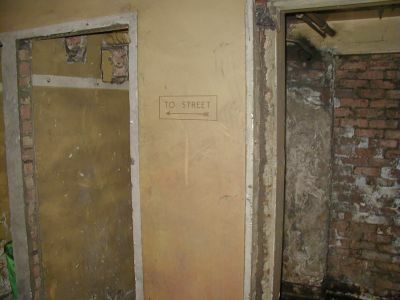 Since then, many of these have been "re-discovered", where the paint has been rubbed off. Here are two such signs. 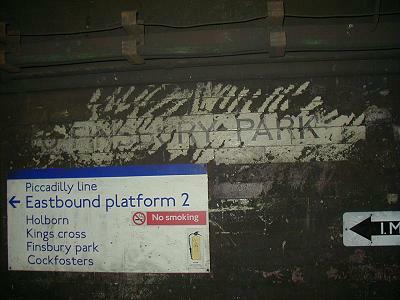 The first shows which platform to stand on to go in the direction of Finsbury Park (the end of the line at that time). The other is a partially revealed Way Out Cartouche, found near the stub platform. As mentioned elsewhere, the modern Piccadilly Line sign is a recent addition to help engineers get their bearings. All material on this page is © 2001,2002 Hywel Williams unless otherwise noted.